It doesn’t matter where in the world you work, paramedics save lives and do not expect to be fired at when they’re doing their heroic duty. 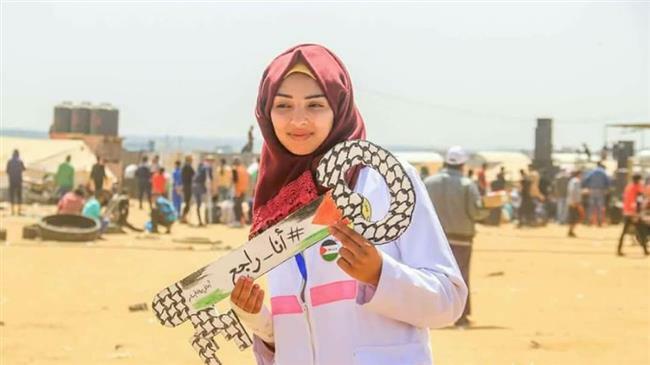 But last Friday as Razan Al Najar went to aid the wounded that is exactly what happened to her as she was blown away by an Israeli sniper. The 21-year-old was on duty as the Palestinians in Gaza continued their six week long protest known as the Great March of Return. The peaceful protests were carried out to mark the Nakba, when more than 750,000 Palestinians were forced from their homes 70 years ago and now their seven million refugee descendants maintain the right to return. Tending to the wounded, she moved around with her hands held high, wearing a medic’s coat and surgical gloves, so that everyone could see she was there in her capacity as a paramedic. Quite what was going through the mind of the Israeli sniper who held her in his crosshairs as he took aim and pulled the trigger is beyond comprehension. How much hate do you have to hold in your heart to kill a young, angel of mercy in cold blood? While Razan took her last breath the US Ambassador to the United Nations, Nikki Haley, was facing down the 15-member Security Council. The UN was struggling, as usual, to formulate any statement regarding the deadly onslaught from Israel directed to the Palestinians, since the start of the marches in Gaza. Kuwait tried to break the deadlock by tabling a motion calling for protection for the Palestinian people. Meanwhile Haley slammed down a US resolution condemning Hamas for a volley of rockets fired from the Gaza Strip in response to the 119 Palestinian dead and 13,000 injured since the protests began. Votes on the two resolutions were taken just shortly after Razan’s life was cut short. Haley was left humiliated having failed to get any votes other than her own with three voting against her resolution and 11 abstaining. This was a history-making episode for the American ambassador. Never before had a resolution crashed with the only support coming from the country which proposed it in the first place. She was further humiliated when she alone vetoed the resolution to protect the Palestinians. This is the same woman who swaggered with such arrogance as she left the debating chamber when Israel’s killing of Palestinian protesters was condemned. Sticking two fingers, metaphorically at protocol, she swept out of the chamber refusing to listen to the plight of the Palestinians. Razan was cut down so brutally in her prime while Haley was cut down and humiliated although she will live on to submit more resolutions to the UN. However, Razan’s name will live on in peoples’ minds for years to come and she will go down in Palestine as a legendary woman while Haley will be lucky if she even makes a footnote in history for her efforts on the same day Razan was martyred. As so eloquently stated by Shakespeare’s Caesar: “Cowards die many times before their deaths; the valiant never taste of death but once.” RIP Razan.